Describing presence as “attuned to and being able to access and express your authentic best self”, Amy focused specifically on presence during challenging, high-stress situations. As a communications coach, I did a little happy dance when Amy mentioned that third point. As I say to my clients, when we communicate, if our body language is not congruent with what we are saying, our audience receives mixed messages. They don’t know which communication signal is revealing the truth: the words we say or the things we show. They sense insincerity. They feel we are faking it. They remain unconvinced. As such, they don’t buy into whatever information, idea, thought or feeling we are selling. We have been unable to express our authentic best self. Presence has eluded us. What stops us from being present? Top of Cuddy’s list, is power, or rather feeling powerless. Power, she explains, can actually cultivate presence. Power impacts the way we think, feel, our physiology, and the way we behave – for example, whether we approach challenging situations head on, or run away and avoid them. If power cultivates presence, how can we be present in those moments when we feel powerless? “Fake it until you become it!” says Amy. Referencing the animal kingdom, Cuddy demonstrates how body language has the ability to facilitate feelings. Extend this to human behaviour, and we know that when we smile or laugh, we don’t just outwardly express happiness; it also causes us to feel happier. The same is true of power. The Power Pose is the expansion of your body (making it appear bigger) in order to express power. 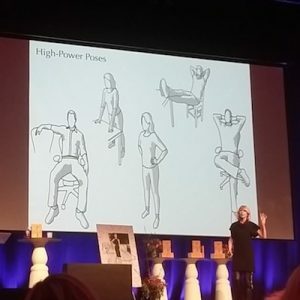 High-power poses are very open and spread-out, in contrast to low-power poses where we seem to shrink in on ourselves. Picture Usain Bolt with his arms raised and outstretched when he crossed the 100-metre finish line and earned his place in history. Definitely a high-power pose – he no doubt felt invincible at that moment. Through her research, Amy has found that much like smiling, expansive posture is not only an expression of power, it is also causes us to feel more powerful. Knowing that expanding our posture and our movements helps to facilitate feelings of power, Cuddy called on her audience to use our body language to help us prepare before a time of high stress. And presence cultivates presence, in ourselves and in those around us. …then your presence will be rewarded with their presence in return. That’s where the real connections happen and that’s pretty powerful stuff.